Tim Van Eyken is one of the most outstanding members of the new folk generation who have taken the folk tradition as inspiration and brought it bang up to date. 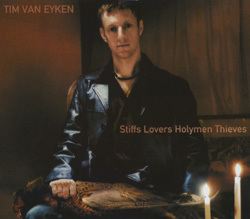 Those who saw Tim Van Eyken win the 1998 BBC Young Folk Award knew there was likely to be a glittering career ahead of this engaging young musician with a passion for English music, and indeed, he was soon snapped up by English traditional musicâ€™s best loved band, Waterson:Carthy. Collecting together a band of like-minded musicians in Nancy Kerr, Oliver Knight, Pete Flood and Colin Fletcher, Tim has produced an astonishingly impressive debut album from the band â€“ Van Eyken. It’s a â€œband albumâ€ in the best sense, with remarkable, imaginative and contemporary arrangements of electric and acoustic guitars, fiddles, accordion, bass and drums that still maintain the essential integrity and gritty reality of the traditional songs and tunes, pacing it firmly in the future, firmly from the past and … firmly of today. This is the first Topic album by this exceptionally assured singer and musician. The production by Tim and Oliver Knight sets new standards for the presentation of contemporary/traditional folk music in England.â€¨.